Making buzz happen online is an elusive enterprise, but BuzzFeed is making a business around it. The New York City startup just raised an $8 million series B financing, led by RRE Ventures. Ron Conway (via SV Angel) and Chris Dixon (via Founder Collective) also invested. BuzzFeed previously raised a $3.5 million series A in 2008 from Hearst, Softbank, and Ken Lerer (who all put in more money this round as well). BuzzFeed founder Jonah Peretti was one of the original founding partners of the Huffington Post. Ken Lerer is the chairman of both companies, and also an investor in BuzzFeed. 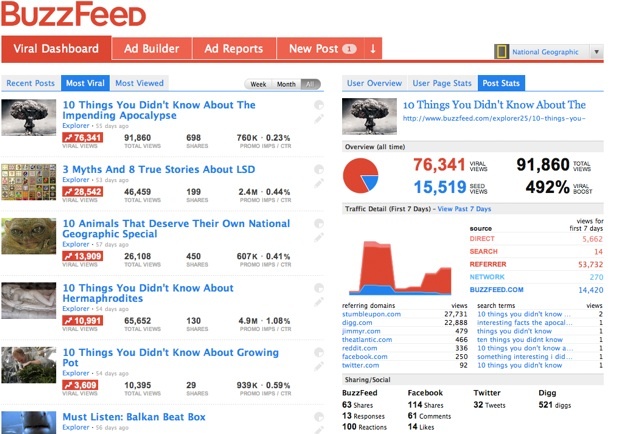 Peretti moved on to BuzzFeed, which tracks and promotes viral video, articles, and other content across the Web. Peretti is also the guy behind the Rejection Line and other online pranks. BuzzFeed’s business is helping publishers like Time, the Huffington Post, brands like Viacom or ad agencies spread the buzz. Along with the self-serve product, BuzzFeed will also settle on a consistent pricing model. The company is also hiring, going from 12 employees a month ago to 25 in the next few months. Not bad for something that started as a side project. Check out this video for some more background on Peretti.